Panic. I'm not the most organised person, I knew I'd never got round to reading 'all of the books'. Where should I start looking? How would I know which books would chime with my own opinions? Would the books scare me? In the end, I stayed clear of the 'what-to-expect' genre. In fact, I quite enjoyed not reading those. Asking other women for practical advice is priceless, important, and much more interesting. This book I did read. The collection of stories put together reminds us of our wild side. 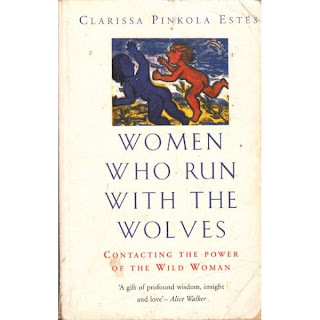 Pinkola Estes takes tales from indigenous cultures and weaves them together to portray women as strong, instinctual and life-giving. We shouldn't be scared, timid things, but like wolves. When I was pregnant, I felt wild. And this book helped me to remember that it isn't a bad thing.